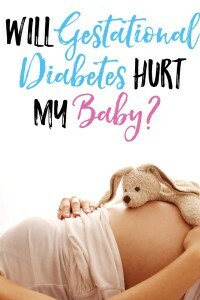 You are here: Home / Gestational Diabetes / Will Gestational Diabetes Hurt My Baby? Gestational diabetes complications are typically the result of poor blood sugar control. So, if you’re wondering, “Will gestational diabetes hurt my baby?” The answer is that it doesn’t have to. Since the gestational diabetes complications listed above result from poor blood sugar control, working to manage blood sugar levels will lead to healthier pregnancy outcomes. You have control over your activity level and your diet during pregnancy. Sometimes diet and exercise are enough to prevent blood sugar levels from getting too high and keep them at appropriate levels. Unfortunately though, sometimes diet and exercise are simply not enough. The only way to know how your blood sugar levels are doing is to check your levels using a meter, test strips, and a drop of blood. The test results will let you and your doctor know how your body is responding. The test results can also be used as a tool to make changes in your diet and see what impact the changes had on your blood sugar. Carbohydrates are the dietary component that lead to increased blood sugar levels. To learn more about eating carbohydrates with gestational diabetes, read this post for a gestational diabetes carb counting diet. « What does antioxidant mean?